Planning for upcoming conference shenanigans and doing lightning talks on tips for conference talks or whatever other topics come up. This class is open to anyone that would like to participate or observe. Additional details will be provided later for the requirements to participate. We’re starting earlier to get through more material. ALL levels of experience are welcome! It helps to have some knowledge of a high-level programming language like C, Python, or Java, but we’ll cover the basics if necessary. You do not have to be a “hacker” to attend. Software reverse engineering is an incredibly valuable skill to have in your arsenal. From CTF competitions to vulnerability discovery, analysis, and exploitation, it’s often necessary to delve into the low-level inner workings of a software sample to get the job done. Knowing how software operates at a low level will also make you a better developer! Software RE can be a daunting discipline to pick up for even experienced software and security professionals, simply due to the intimidating breadth of knowledge that can be required just to get started. This workshop aims to outline your foray into RE and focus on the foundational skills needed to learn quickly and be successful. We may even solve some crackmes! You didn’t think you’d get out of this without some hands-on practice, did you? The examples in this workshop will require a 64-bit Intel Linux system (virtual, Windows with WSL, or native) to run. There is also a Docker image at 3pidemix/reveng with the necessary environment configured to run the examples. Labs and setup instructions can be found here: https://goo.gl/tcyZ3a Please review them prior to the workshop if you plan to participate in the hands-on labs. DC919 will be hosting an introduction class on network security including Firewalls and IPS/IDS. It will give you an overview of how to secure a network and some hands on with a few tools to get started. Bring your unwanted conference T-shirt, socks, and other swag to give away and pick up something you like. BSides RDU 2018 T-Shirts will be available. BSides Raleigh 2017 and 2015 T-Shirts – Very limited sizes and supply. Anything unclaimed at the end will go to the Durham Rescue Mission. It’s in the small alley way next to Carolina Brewery down the flight of narrow stairs. We’ll be meeting in the back room. Most nearby lots say permits are only enforced on weekdays, but some are 24/7. MsMouse setup a CTF environment and steps us through the basics of how to play a CTF. Additional details and laptop setup recommendations to be posted later. This is just announcing Def Con 26 in Las Vegas. Join Def Con 919 where it all began. Further details will be provided later. There will be an image to download prior to the meeting that will be used to step through a forensic investigation. 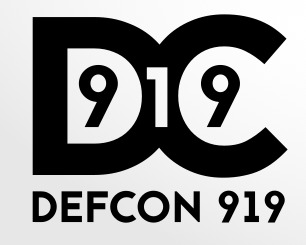 Def Con 919 will be community sponsoring this event, but it’s not an official Def Con 919 event, be sure to register and buy your ticket when they become available. Security BSides is a community-driven framework for building events for and by cyber security community members. The goal is to expand the spectrum of conversation beyond the traditional confines of space and time. It creates opportunities for individuals to both present and participate in an intimate atmosphere that encourages collaboration. It is an intense event with discussions, demos, and interaction from participants. It is where conversations for the next-big-thing are happening. Security is top of mind across the entire sphere of IT and the world beyond. Therefore, more people and organizations are interested in the next new thing in security. BSides is the place where these people come to collaborate, learn and share. With many tech-companies, colleges and universities in Raleigh, Durham, Chapel Hill and surrounding areas, it is also an international center of innovation in the security industry.